KWE Technologies Group has several controls available for your home-heating needs. For your convenience, we now accept Interac, Visa and MasterCard in-house. Please contact us for pricing. This room thermostat features seven-day programming and is meant to work with any OpenTherm modulating boiler. DHW Pump Control Module with bleed-off timer. The system manager for communication with up to eight boilers. Zone Pump Controller. Easy to install with lots of features. 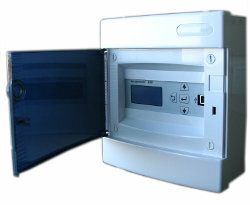 Cascade control for Viessman boilers (up to 16).